Once again I find myself bumping an already-scheduled post (Leap Seconds) previewed last week. That sometimes happens when there’s multiple interesting things happening in the sky (or atmosphere) around the same time. In this case, it was the confluence of Comet Lovejoy’s appearance and a close conjunction of two planets: Venus and Mercury. For all you photographers out there, here’s the EXIF data for my image: Canon EOS 20D with standard 18-55 mm lens at full zoom, shutter priority: t = 4.0 s, ƒ/20, ISO 3200, Jan 14, 2015 7 pm MST, Heimhenge, AZ. The view is toward the southwest, about an hour after sunset. The closest approach of these two planets actually occurred on January 10, when the two were separated by a mere 39″ (a little more than one Full Moon diameter). In my photo above, the two are separated by 1°21′ (about 2.7 Full Moon diameters). One Full Moon diameter is about 0.5°, which is 30′. Distances in the sky are measured in degrees-minutes-seconds, since distances projected on the 2D dome of the sky can’t be measured in the usual kilometers. 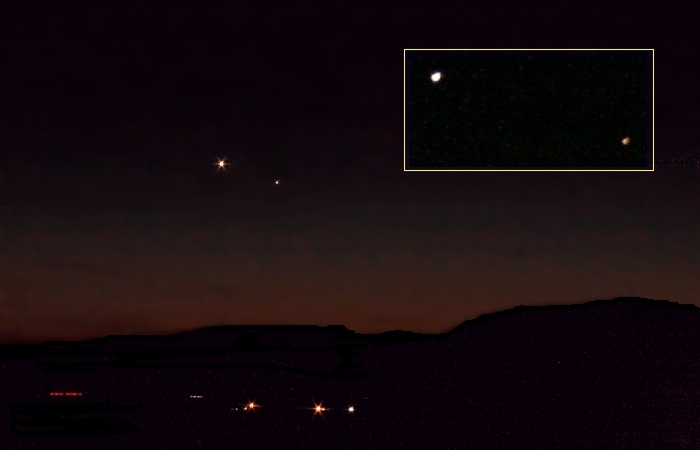 At the time of that image, Venus and Mercury certainly “appear” close, but are actually separated by about 60 million kilometers (37 million miles), with Mercury the closer to Earth. To see a plot of current planetary positions, go here. Select the “Inner System” button, and increase the “Size” to 600. If you want to see a different date, you can enter that too. It’s a handy website that I keep in my bookmarks and frequently reference. Over the next weeks you’ll see Mercury drift toward the horizon, and Venus rise higher towards a triple conjunction with Mars and the young Crescent Moon on February 20th. After that, Venus will continue to rise higher until June 6, when it reaches greatest eastern elongation. At that time it will be near its brightest, playing the role of “Evening Star.” After June 6, Venus drifts back toward the horizon on its way to becoming the “Morning Star.” Along the way, Venus will have a very close conjunction with Jupiter, with a separation of only 20″ (2/3 of a Full Moon diameter). To follow all this action, keep watching toward the southwest shortly after sunset. And have your cameras ready for what some are calling “the year of close conjunctions.” You can bet I will, and I’ll post those photos here. Clear skies!